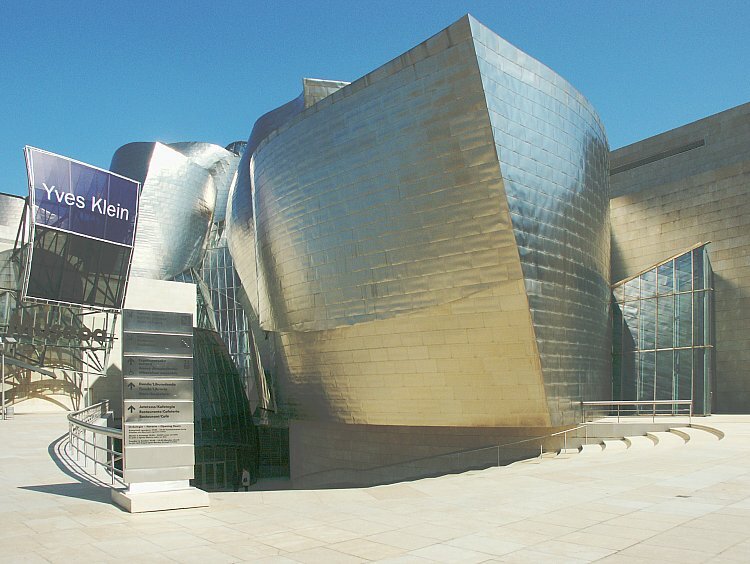 Images of Guggenheim Museum, Bilbao, Spain, by Frank Gehry. 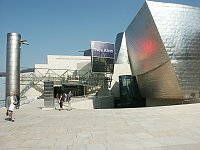 Please note that these photographs were taken on two different days. The colored reflections on some of the buildings indicate that the installation Quantum field-x3 by the Japanese artist HiroYamagata was activated. This installation consisted of large holographic panels on which laser beams were projected. 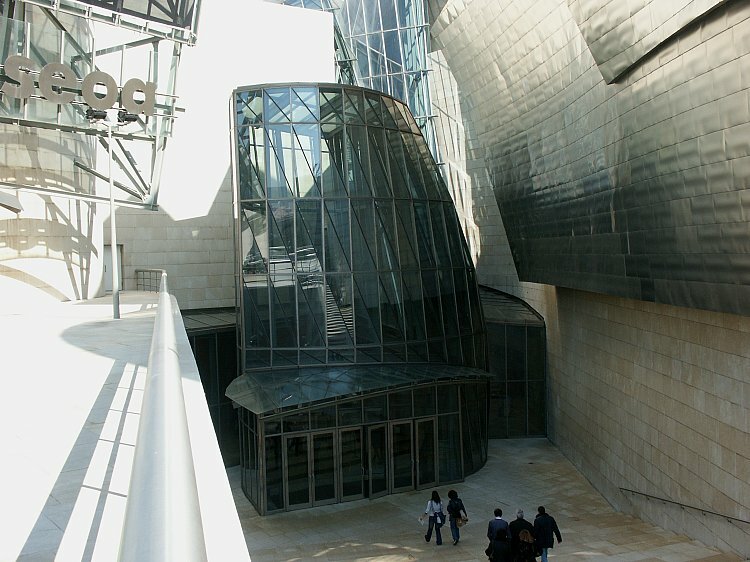 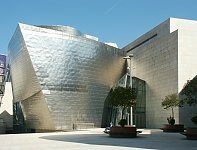 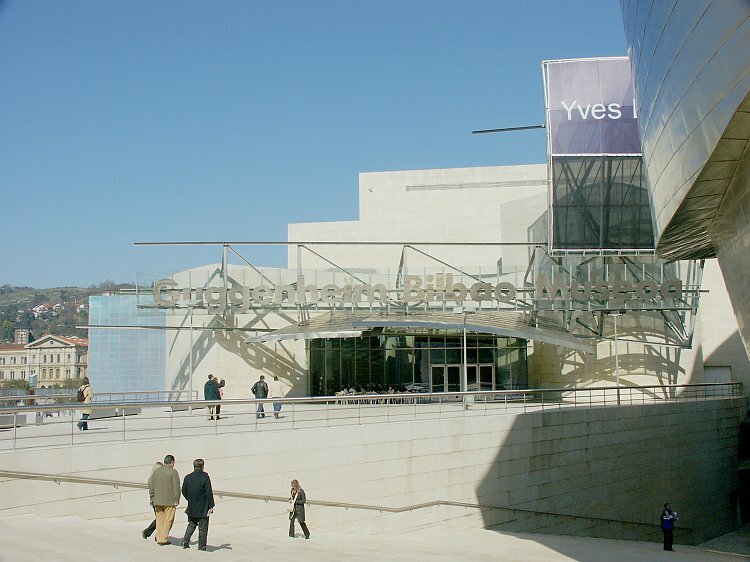 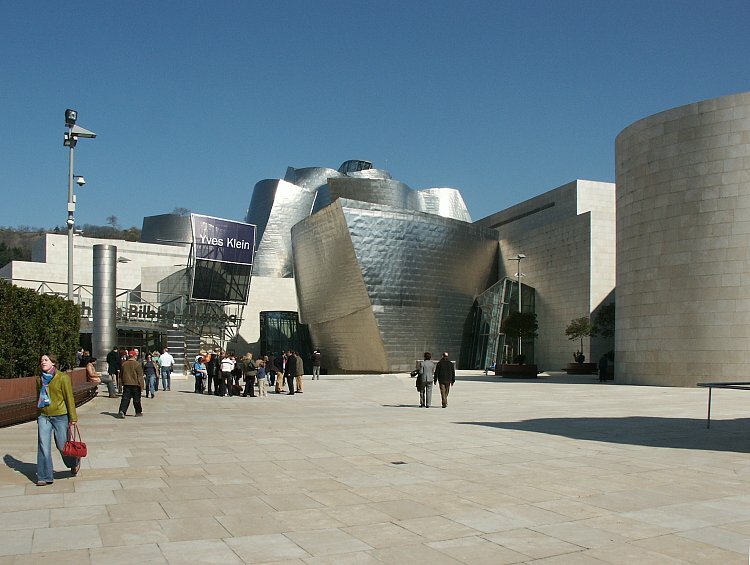 The Basque government commissioned Frank Gehry to design this new museum, affiliated with the Guggenheim Foundation. 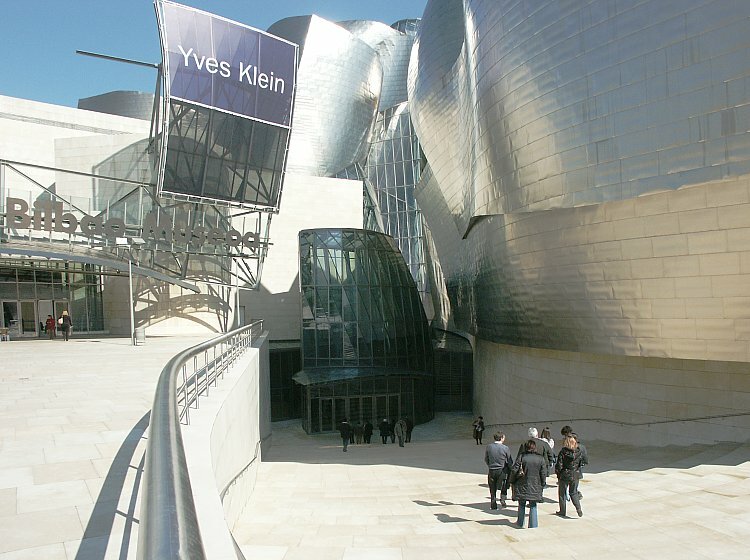 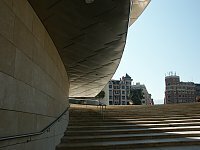 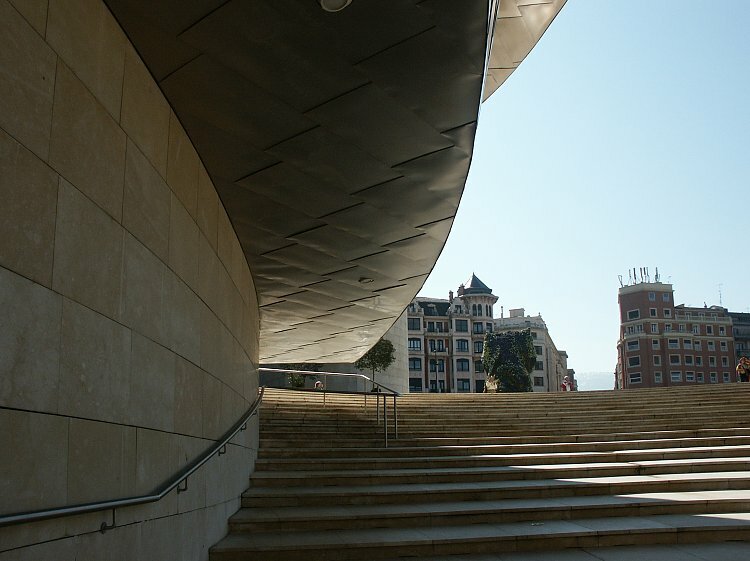 It was conceived as a means of redeveloping the city of Bilbao. 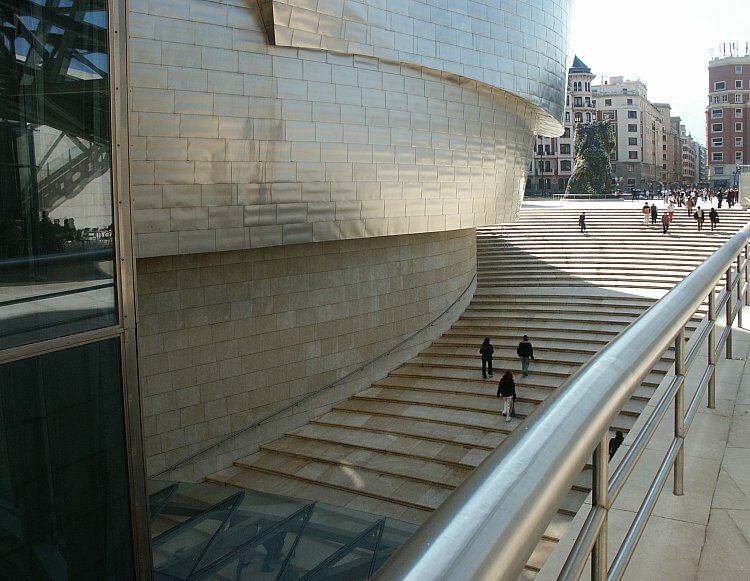 Other projects contributing to this aim have been completed or are in the works, many by other world-famous architects, including the Sondica Airport, city's airport by Spanish architect Santiago Calatrava, a new Conference and Performing Arts Center, designed by Federico Soriano, the construction of a metropolitan railway and underground transportation system, designed by Sir Norman Foster, and a new pedestrian bridge crossing the river at Uribitarte, also the work of Calatrava. 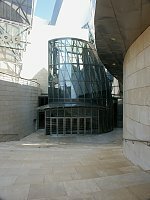 See the official site for a floor plan of all three floors (the map tab at the top)and elevations (in the compass at the bottom right of the map}. 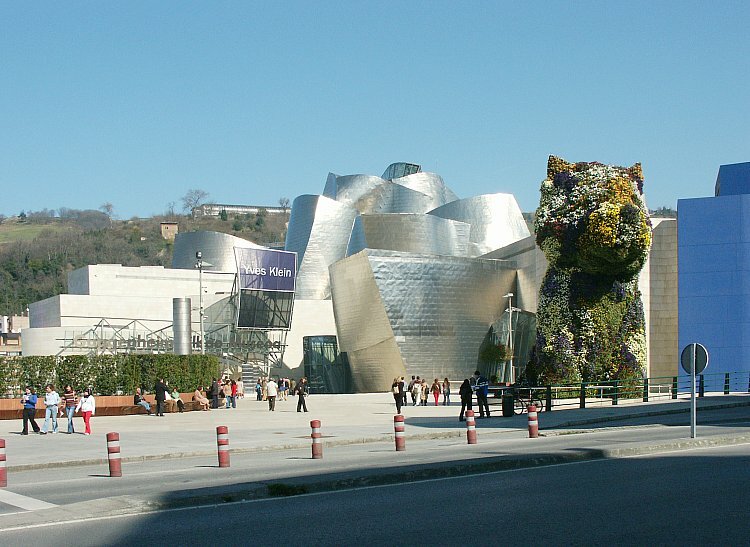 See additional views of Jeff Koons' gigantic Puppy, now part of the permanent collection though covered in perishable flowers. 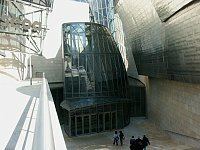 Unlike the typical museum with a monumental stairway leading to the main portal, here the visitor walks down a long, gently sloping flight of stairs to the main floor. 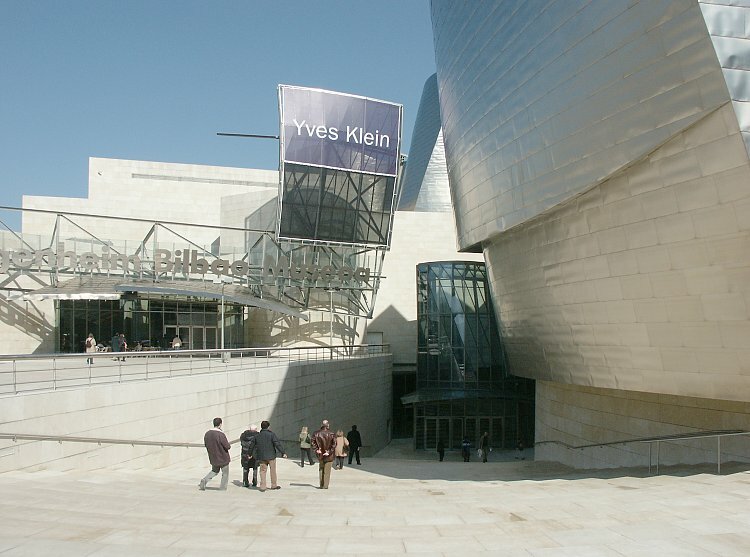 This is Gehry's solution to the differing heights of the city of Bilbao and the museum site, which on the north side borders the Nervión River, 16 meters lower than the city proper. 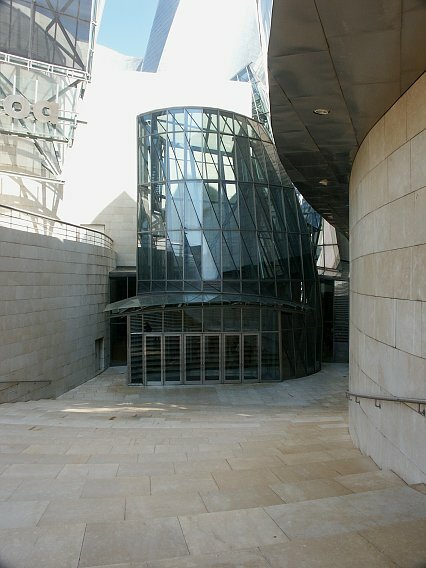 The upper thoroughfare (on the left of both photographs) leads to the second floor which houses a museum shop and cafe, sometimes extending outdoors. 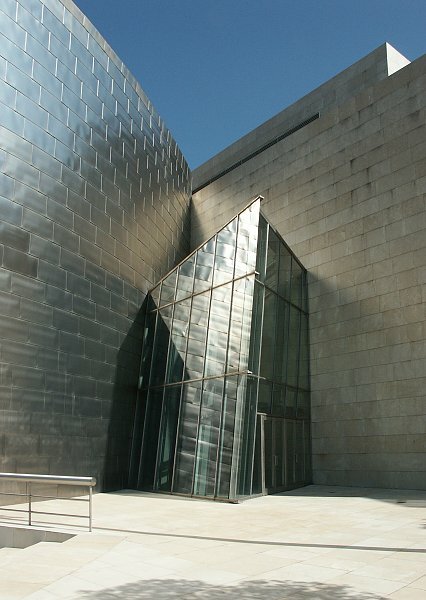 Three materials are important in the construction of the museum: titanium panels, with a guaranteed long life, clad the bent and curved forms which primarily house temporary exhibits; limestone clads the areas of the permanent collection. 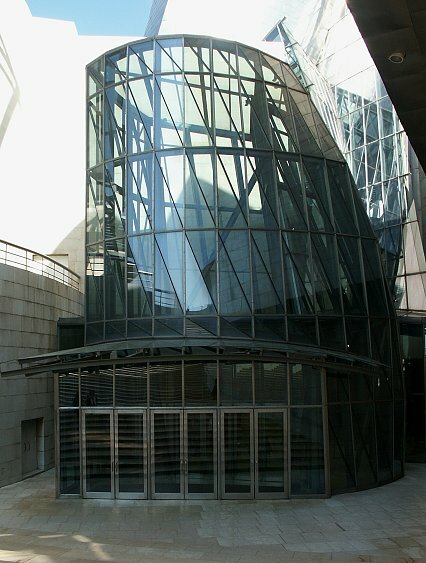 Glass curtain walls, sometimes tubular, as here, are important in filtering light into the building. 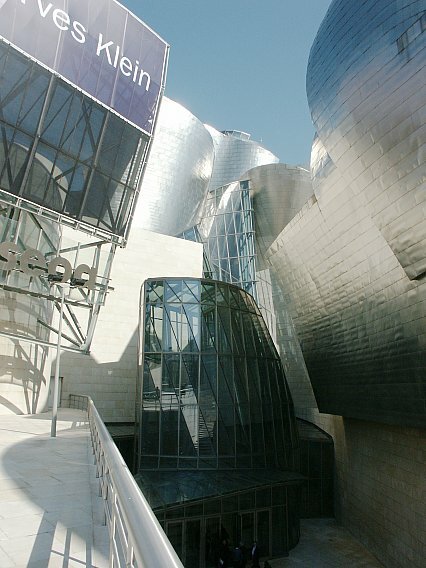 Continue to page 2 for additional views.